This post is sponsored as part of a partnership between The Grateful Gardenia and ChromaDex. 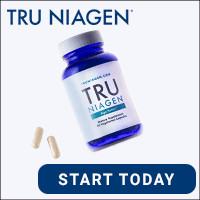 All opinions are my own, and, yes I take TRU NIAGEN® every morning. I spent many years as an actress, and after a long hiatus from film and television, I’m excited to return to work in a brand-new role. I’d like to share with you how TRU NIAGEN was tremendously helpful in keeping me energized on set. Here are three ways this incredible supplement has helped keep me at the top of my game. I have been taking TRU NIAGEN since June 2018, and the first thing I noticed was a difference in my energy levels. My new recent project required night shoots, which often meant I would be working until 2:30 am. Honestly, I haven’t stayed up that late in years! So how does TRU NIAGEN work? Nicotinamide adenine dinucleotide (NAD) is an essential coenzyme that your body naturally produces. Your cells rely on NAD to help them generate energy. TRU NIAGEN is clinically proven to safely and effectively increase your NAD, to help your cells produce the energy you need...without relying on caffeine. Remember what I said about those crazy schedules? When you’re living the #setlife, it’s not uncommon to work until the wee hours, try to catch a few ZZZs whenever and wherever you can—then start all over again the next day. It can really mess with your circadian rhythms. NAD helps regulate circadian rhythms at the molecular level by providing feedback between circadian activities and your body’s internal clock…a mechanism that starts to suffer when you’re doing a hard day’s work through the night. TRU NIAGEN helped me wake up feeling more energized, regardless of what time of night (or morning) we wrapped. We all want to do our best at work, no matter how old we are. But to be honest, I was a bit concerned when I saw our shooting schedule—especially since I was returning to the screen after a long break! It’s hard to know how your body will react. What’s more, our NAD levels can decrease by up to 50% between the ages of 40 and 60. And when our NAD levels are low, our cells have a harder time producing the energy they need to maintain health as we age. I was concerned that this project’s late nights, long hours and irregular meals would put additional metabolic stress on my body—stress that would keep my body from functioning at peak performance. But with TRU NIAGEN on my team, I have been able to support my metabolic health throughout the process! Check back in so I can share my progress with you! Looking back at 2018 was a year filled with opportunities, adventures, and meeting fabulous people! Not only was it a fun travel year, but it was also a year of non-stop events, diving into technology and falling in love with Downtown LA. My favorite thing about being a blogger is the constant discovery of the special places in your own backyard. These last few months I had a strong desire to get back to where and why I began this blogging journey. It’s like hitting the refresh button and it’s given me a new perspective and appreciation for a simple idea… Discovery of a passion and sharing that with others. What I love about Cuba; Cuba was a destination I personally had always wanted to go to. It was the people that I was intrigued by the most. After all, Ernest Hemingway wrote about Cuba from a place that made you want to discover the mystery. The contrast of the dilapidated buildings and the warmth of the locals said it all. We had the chance to meet one of Cuba's top young entrepreneurs Carlos Garcia, the founder of Kewelta. Carlos is leading the way for technology and his office is around the corner from the Hotel Nacional. We were invited to his office to meet his team, and talking with them left you with certainty that this group of young entrepreneurs are switched on! Read on for more information for visiting Cuba. Ok, can we talk about one of the best local staycations in Los Angeles? The fact that I can hop in my car and be in Ojai at Caravan Outpost and kicking back in an hour is music to my ears. My friend and fellow blogger Melissa Meyers were thrilled to discover this special spot and we can’t wait to return. It’s a must! Probably one of the best vacation spots our family has ever been on. Who knew Croatia was such a special and sacred location that would elevate our love of travel. It’s a hotspot destination right now and well worth a google. The people, the food, the water… and the price! For 2019, I hope it’s a year filled with discovering your passions. We really never know what awaits us on the other side of that door. It’s our job to do the work, discover what makes us tick… that’s the laboratory to our soul. Happy New Year! Thank you so much for joining me on this journey!